MF Communications supplies Unify and Siemens Openstage business phones and parts to companies around the world. Siemens Openstage telephones are a range of stylish desktop phones. They range from basic to executive models, but all come with a broad range of functions across the range. The telephones are ergonomic and easy to use. All have high definition voice quality and users can enjoy touch sensitive controls, innovative user interfaces, and simple navigation and colour high-resolution screens. The Siemens Openstage business phones range is available for TDM environments, as well as IP environments. To manage them within the overall IT infrastructure is an easy task. The Openstage family is highly functional and integrates well with other devices. The models in this range are multimodal, allowing access to various applications and services. Designed with user friendly, simple features, the Openstage phones use touch sensor keys, LED’s and simple navigation to access the range of features. They are an ideal solution for offices where mobility and flexibility are important factors. Using a range of adaptors, Openstage phones can easily connect to fax machines, other phones or any add-on modules that are required. Built in USB and Bluetooth interfaces allow interaction with many different devices, such as PC’s, mobile phones, PDA’s and headsets. The models are available in a variety of colours and finishes, from plastic in ice blue or lava to high-end silver blue metallic lacquering and brushed aluminium. They come in T, G, HFA and SIP variations. 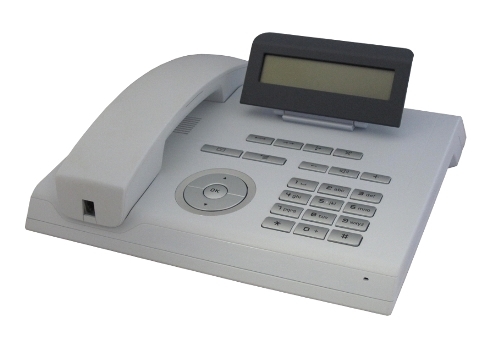 The Siemens Openstage 20 telephone is a value for money model with an array of easy to use features that make it suitable for any office environment. This full duplex, hands free telephone comes with integrated microphone and loudspeaker. The Siemens Openstage 20 is compatible with the HiPath Open Office ME and HiPath 3000 telephone systems and is available for TDM, HFA or SIP environments. Available in ice blue and lava colours, the Siemens Openstage 20 telephones come fully tested and with a warranty. Models available include: Openstage 20 T, Openstage 20 HFA, Openstage 20 SIP and Openstage 20 G.
MF Communications currently has a special offer on the Openstage 20 range. See the website for full details. The Siemens Openstage 15 phone is a competitively priced model with an array of easy to use features. It is suitable for a variety of uses. The Siemens Openstage 15 telephone is compatible with the HiPath telephone system and is available for TDM, HFA or SIP environments. This full duplex, hands free telephone, with integrated microphone and speaker, can support the addition of the Openstage Key Module 15 for add-on features. The Siemens Openstage 15 business telephone comes fully tested and with a warranty. Models include the Siemens Openstage 15 HFA phone, Siemens Openstage 15 SIP phone and Openstage 15 T.
If you are looking to buy new, remanufactured or refurbished Openstage 15 HFA or SIP phones, we have special pricing on the Openstage 20 range that you can use instead. The Siemens Openstage 10 is a non-display, competitively priced Entry Level model, compatible with the HiPath 500, HiPath 3000 and HiPath 4000 systems. The Siemens Openstage 30 is a full duplex model, compatible with HiPath 3000 and HiPath 4000 systems. It is available for TDM environments. The Siemens Openstage 40 is suitable for any office environment, due to its many customisable features. Models available include the Openstage 40 HFA and Openstage 40 SIP. The Siemens Openstage 60 is a high spec. model, for frequent telephone users. Available as Openstage 60 T, Openstage 60 HFA and Openstage 60 SIP. The Siemens Openstage 80 is the top of the range executive/management phone of the Openstage family. It has a wide range of functions and a large LCD display. The models in this range include Openstage 80 T, Openstage 80 HFA and Openstage 80 SIP. MF Communications stock a complete range of new and remanufactured Siemens Openstage business phones, including T, SIP, HFA and G models. We also supply the full range of Unify Openstage Phones and phone accessories too. Not sure what you’re looking for? Call +44 (0)1892 514687 to speak to one of our expert telecoms advisors.